It was in the summer of 2008 that the bandshell debuted. The plan for it was spearheaded by the Siren-Webster Rotary, with Joe Wacek as President. The bandshell project was in celebration of the Rotary's 100th anniversary. Joe's father (a member of the Allouez Village Band), brought the idea to the Rotary, and after two years, the funds were raised. The cost was roughly $50,000 - 70,000 and was funded with in-kind donations and. generous donations from individuals, contractors, and suppliers. A fundraiser was held in which people bought bricks and had inscriptions placed on them. These bricks were placed at the front of the bandshell. A donation of $10,000 by Dr. Norman and Mrs. Jensen of Madison, WI, put the fundraising over the top, and that is when construction started. A plaque on the back of the bandshell lists all of them. The Rotary worked with Craig Selander, a local architect from Grantsburg, WI, to design it. 2018 marks the 10th anniversary of the free Siren Music in the Park summer concert series at the bandshell. From June through August, every Thursday evening, regional performers are featured. 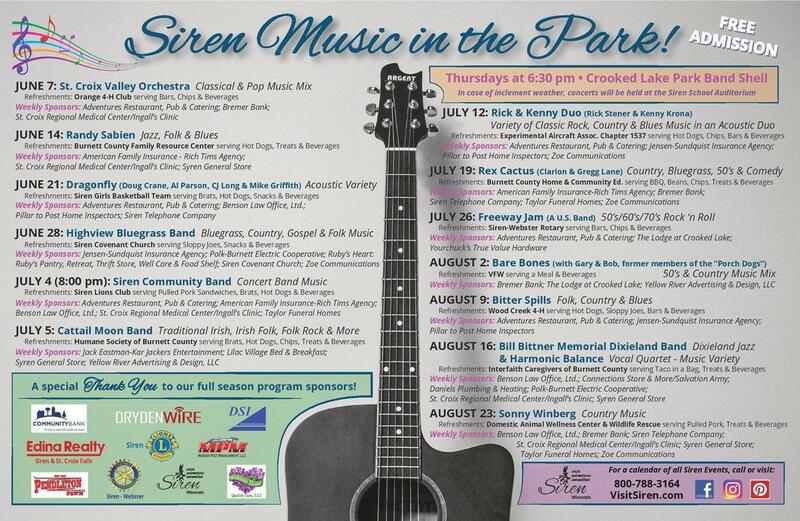 An annual concert by the Siren Community Band is held every 4th of July evening, followed by a fireworks display by the Siren Lions Club over Crooked Lake. The bandshell is also available for rental by individuals or groups, church services, or other events. The summer season poster which celebrates the 10th anniversary of the bandshell.